Today, the Social Science Research Council released a large-scale study of music, film and software „piracy“ in the emerging economies of Brazil, India, Russia, South Africa, Mexico and Bolivia. 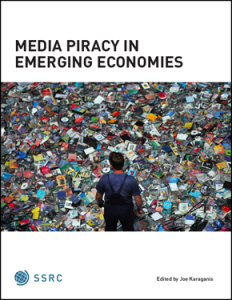 Media Piracy in Emerging Economies is must-read for everybody interested in global media markets and the shaping of the international copyright framework. Directed by Joe Karaganis, Program Director of the Social Science Research Council, some thirty-five researchers worked together over three years to produce this unique study. The country reports on South Africa, Russia, Brazil, India, Mexico and Bolivia provide a fascinating panorama of the diversity of cultures. They also follow some common themes: that of access to cultural goods, of the desire to be included in global culture and the differential effects illicit trade has on local culture, on the socioeconomics of advertising, pricing and consumption, the varied sources of unauthorized copies mostly in the form of optical discs but with the rapid proliferation of broadband Internet access increasingly through file-sharing, on the moral economies of justifying unauthorized copies and, most importantly for public policy makers, on copyright law on the books and the reality of private and government enforcement efforts in these countries and in the global arena. One of the main goals of the report is to critique the discursive authority of industry claims and their link with US-American politics, most notably the work of the IIPA (International Intellectual Property Alliance) and the way it feeds directly into the US foreign trade policies in the US Trade Representative’s Special 301 process. This unholy public-private partnership then continues with industry enforcement bodies influencing police and other government agencies in the countries covered in the reports. The first two chapters as well as the country studies document this blurring of the lines between public and private powers. „Relative to local incomes in Brazil, Russia or South Africa, the retail price of a CD, DVD or copy of MS Office is five to ten times higher than in the US or Europe. Legal media markets are correspondingly tiny and underdeveloped.“ The point is well known and the study adds anecdotal evidence supporting it, yet it is crucial for understanding the dynamics in question: the lack of revenues for the use of the culture industry’s products in these markets is the result of its own business strategy. Next to pricing at a point where no one but the rich elite can buy, this includes „windowing“ for movies and TV series. The Indian chapter relays the especially drastic example of the Oscar-winning movie „Slumdog Millionaire“ which created global public attention but came to Indian movie theatres only five months after its original release — by which time most everybody interested had already seen it on an unauthorized copy. All the country reports cover music, movies, entertainment and business software and to a lesser degree books, with a final chapter on the history of unauthorized reprinting of books from Gutenberg onwards. All of them also sketch the copyright law and enforcement landscape. The Brazilian chapter in particular presenting for the first time a complete picture of the legal framework and agenda, the government and private actors and the rhetorics, including the claimed link to organized crime and the „magical numbers“ on the supposed damages caused by illicit distribution. A very different story emerges from several reports on how unauthorized practices have been essential in educating both audiences and artists and creating the foundations for the production, distribution and consumption of legitimate local cultural works. This report will change the global debate on access to informational goods, on the creative industries and on the justification for copyright and its enforcement. The work will continue in a follow-up study that Karaganis and many of his partners have already started to undertake.